You have to love the marketing geniuses at Monster Energy Drink. As I suggested in a previous post, it and similar products have become the new frontier for food advocacy, largely because of linkages, as yet unproven, between their high caffeine content and the deaths of several young people. Now, Suffolk County has passed legislation that blocks companies from giving free samples and coupons to minors and selling the drinks in county parks. In 2010, Suffolk Country introduced a previous version of the bill that proposed to ban sales of energy drinks to anyone 19 or younger. How is Monster Energy responding to such assaults? Clever: change its labels from Supplement Facts to Nutrition Facts. As explained in the New York Times, Monster Beverage “will no longer be required to tell federal regulators about reports potentially linking its products to deaths and injuries” [doing so is required for supplements, but not foods]. A spokesman for Monster, Michael Sitrick, said the company had decided to market its products as beverages for several reasons. One was to stop what he described as “misguided criticism” that the company was selling its energy drinks as dietary supplements because of the belief that such products were more lightly regulated than beverages [Misguided? They are more lightly regulated]. Another consideration, he said, was that consumers can use government-subsidized food stamps to buy beverages [EBT-card benefits cannot be spent on supplements]. Let’s see if other places follow Suffolk County’s lead. Nick Saul and Andrea Curtis. 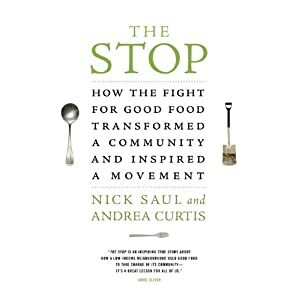 The Stop: How the fight for good food transformed a community and inspired a movement. Random House Canada 2013. Husband and wife team Saul and Curtis wrote this chronicle of Saul’s 15-year stint as the director of The Stop, a place that started out as a soup kitchen but ended up as much more. This is an important book. The Stop is no ordinary account of the substantial benefits of soup kitchens to servers and served. It is an impassioned account of how to create food systems that foster independence and eliminate the indignities of charity. Saul and Curtis put a human face on poverty. 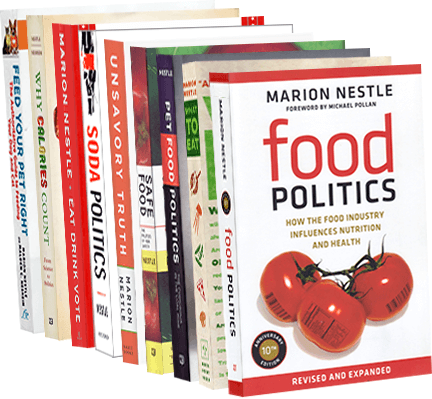 If you want to know what today’s food movement is really about—and why it is anything but elitist–read this book. Ordinarily, I hope that readers will order and buy books I mention at local, independent bookshops. But this one is only available in Canada. Here’s its link at Amazon Canada. Former Senator (D-SD) George McGovern died yesterday at age 90. His accomplishments as a Senator and statesmen were legion, many of them strongly connected to food politics. As I mentioned in 2009 when I gave the state department’s annual George McGovern lecture in Rome, he chaired the Senate Select Committee on Nutrition and Human Needs from 1968-1977. This committee greatly expanded food assistance programs and then developed the first federal guidelines for chronic disease prevention: Dietary Goals for the U.S. In Food Politics, I described the work of this strongly bipartisan committee (Bob Dole was its lead Republican member) and how it did so much to improve the lives of women and children living in poverty in the United States, and of poor people throughout the world. The committee also broke new ground in shifting nutrition education from a focus on eating more of a variety of foods to eating less of foods that increased risks for chronic disease. What’s shown here is the February 1977 version of this landmark report. As the result of outraged protests by food producers affected by the “eat less” messages, the committee was forced to tone down its recommendations. The committee issued a revised report in December that year. That was the committee’s final act. Congress disbanded it and McGovern lost his bid for reelection. McGovern leaves an extraordinary legacy, one unimaginable in this era of partisan politics. He was far ahead of his time, as this 1977 photo shows. It is a fitting tribute.